4 What’s next on the legislative calendar? The daily fantasy sports industry — or at least DraftKings and FanDuel — went three-for-four on the legislative front this week. The biggest development was in Mississippi, where a law was enacted, according to an industry source — the fourth state to officially legalize and regulate the industry this year. Mississippi Gov. Phil Bryant signed a fantasy sports regulation bill — S 2541 — into law, a source familiar with the legislation told Legal Sports Report. Friday was the deadline for him to act on the legislation. That’s a major victory for DFS sites, most of which pulled out of the state in the wake of a negative opinion from the attorney general in January. FanDuel and DraftKings did not immediately respond to if and when they would reenter the market. The news in Mississippi came after both Missouri and Colorado sent bills to their respective governors this week as well. The only true setback came in Minnesota, where a bill was shelved for the current legislative session. The bill is a fairly simple piece of legislation compared to bills in other jurisdictions. The bill sets up the Fantasy Contest Task Force to review the industry and suggest more comprehensive regulations. It says that fantasy sports operators must register in the state to operate — without a licensing fee. Basic consumer protections are also implemented by the law. The law repeals itself on July 1 of next year, by which time the state may act to put in place more robust regulation. More details on the bill as enacted here. Kansas passed a law formally legalizing DFS last year. Massachusetts Attorney General Maura Healey instituted regulations for the industry this year. 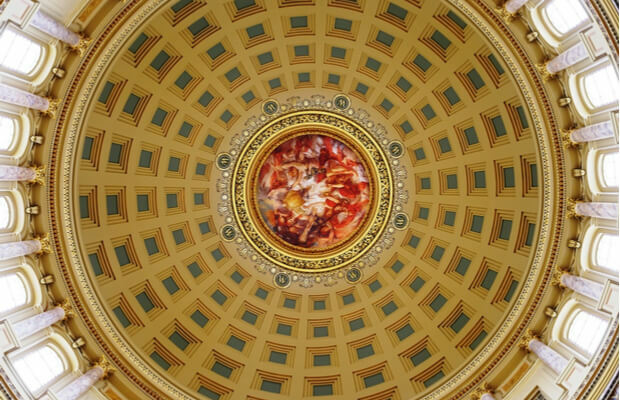 What’s next on the legislative calendar? There are precious few states where laws could still make it to the finish line this year. Here’s what the current legislative map looks like. Green states are already legal; in red states, bills have been shelved or legislatures adjourned without taking action; gray states have some sort of active bill. There is no action in white states. Of the gray states not listed above, only a few seem to have a realistic chance of passing legislation this year. That includes two crucial states — Illinois and New York. Illinois is a state where FanDuel and DraftKings are challenging a negative attorney general opinion in court. A bill in the state has made precious little headway; the legislature is scheduled to adjourn May 31. Legislation does not appear to be a favorite to become law, based on publicly known momentum. New York would appear to have a better chance than Illinois of passing a bill, but obstacles remain. FanDuel and DraftKings reached a settlement with Attorney General Eric Schneiderman in March with the hopes of reaching a legislative solution. There is about a month left in the legislature’s session, and everyone is still waiting on a bill from Rep. Gary Pretlow that he hoped to have ready in April. Things can happen quickly with legislation in the New York statehouse because of behind-the-scenes maneuvering, so DFS legalization is definitely still in play. Also of note: A DFS bill in California was recently referred to a committee in the Senate 3 1/2 months after it passed the Assembly. Next Story → Daily Fantasy Sports Weekly Wrap: What Will Happen In Illinois, New York?